I've had this pantograph design (for long-arms) that I've wanted to use. Isn't it beautiful? But I don't have a long arm. 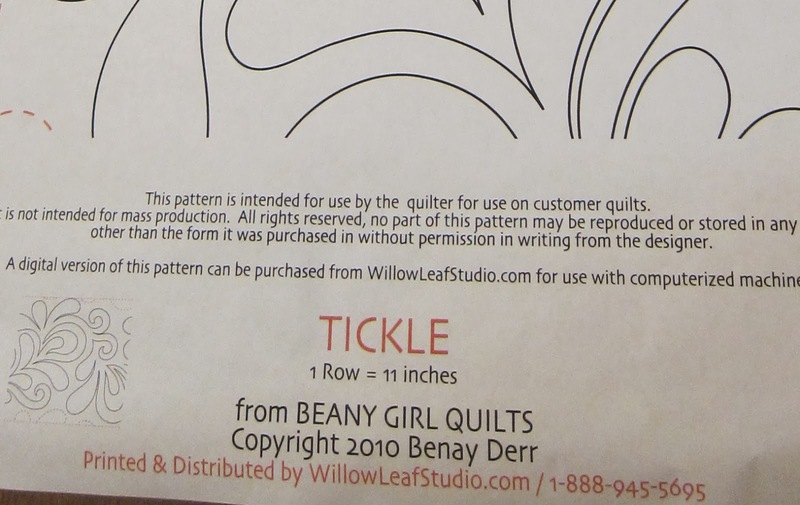 My first method was to trace a row onto thin tracing paper made for quilters. Then I pinned it on and quilted the first row across. Then . . . . I HAD TO PICK OUT ALL THAT PAPER! I didn't want to go through that whole process 10 more times. So, I made a stencil. Yes, I traced it and cut it out with my tiny scissors. I think there's a tool that would have made that MUCH faster . . . (note to self: must look into that).
. . . tracing onto quilt with disappearing pen . . .
quilting finished . . . So, a question to you free motion quilters out there . 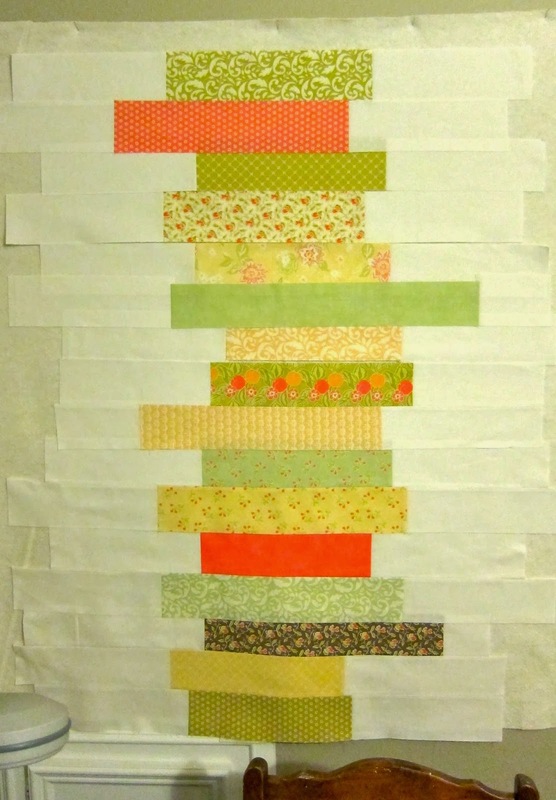 . . is there a better way to quilt a specific pattern that is too long to must memorize in your head? What have you tried? Lovely design, I tried using one of those markers similarly before and the ink faded before I got halfway through my quilting! I just remember it, as I don't like following a marked line. I do bed quilts on my regular machine, no long arm. The wall art is easier of course. For patterns like yours I trace it on paper a few times first but usually like to get lost in the process instead of planning too much,. There is a better way! Check out my free motion quilt tutorials at The Inbox Jaunt! There are nearly 75 motifs and tutorials with step by step photographs and instructions! AWesome, Lori! I"ll do that. I love the design! It will look so wonderful when you are done! That's commitment to a plan. The end product is wonderful, but if you can find a quicker way, all the better. Oh my goodness, it's going to be gorgeous when you are finished! What a great idea. I have one of those rolls and no longarm machine as well. The only think I've come up with is the stencil idea too. You can make stencils by ironing a few layers of freezer paper together and sewing along your lines with a threadless needle. Your quilting is beautiful. Well, whatever your method, your quilt is looking lovely! Wonderful finish. I also used a stencil and marked with a chalk marker my lines. I would love an answer to the same question! But as the others have said, the quilting is absolutely beautiful! Nice job! You did a great job with your tracing method. But, it is hard to remove the thin paper. You might try next time on a small project using your tracing paper, you can just sew through the design without thread to poke holes in the paper....then lay it on top of your quilt, use the Pounce pad with chalk that irons off when you are finished. You might try tracing on freezer paper, and then stitch without thread to use the pounce method. The freezer paper would be more durable for a stencil using the chalk pounce pad. Best wishes! Thanks everyone for your comments. So far several have commented about making a stencil using freezer paper. Sounds much faster. I will try that next time. I too have used tracing paper and cut my own stencil both methods are quite tedious. I have used freezer paper by sewing holes in it without the machine being threaded. Then pounced with chalk. Curious to see what Lori's method is all about. Nevertheless your quilt came out quite lovely! There is a type of fusible web that dissolves when you wash it. 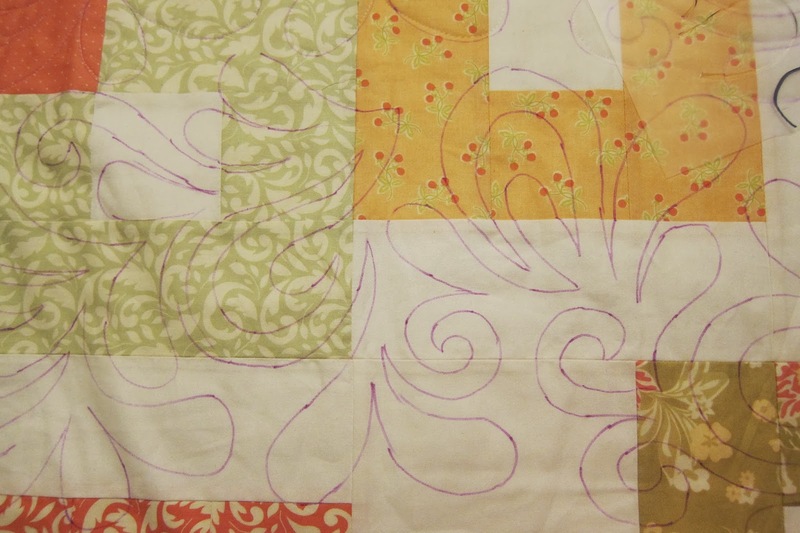 You trace your pattern onto it with the blue water soluble marker and then stitch to your quilt. I just cut the majority of it away then and the remainder disappears in the washer. Wow, that is a really pretty design! I can't believe you had to rip out all that paper! I am glad you found a better way! Hi. I am a long arm quilter since 1994. Back before laser pointers and stitch regulators. You can make any pattern a panaquilt and use your home sewing machine by using tulle (bridal veil or netting). Cut the tulle to the size you want to repeat for your quilt design. Lay the tulle on your pattern and tape with painter's tape to hold. Use a permanent marker to trace your panaquilt design on tulle. Once the tulle is prepped and you can see your permanently made marks on the tulle. Stretch the pattern traced tulle on your quilt top. You can pin this or use some spray adhesive. Retrace the panaquilt design through the tulle to the quilt top with a washable marker. WASHABLE MARKER FOR MARKING THE QUILT. Test on a scrap to check if washable. If it is a dark quilt you can use a chalk pencil for this technique too. Success is when you remove the tulle and the washable ink will go lightly through the mesh to mark the quilt. REMOVE THE TULLE, it is used for tracing on only. Then you stitch. After stitching, spray the area with water and remove the washable marker marks. The tulle can be rolled up and used for another quilting project. You can wash the tulle too if it gets dirty after years of use. This technique works for borders and insets too. Rose, thank you so much for our comment. What a brilliant idea, using tule as a stencil. I can hardly wait to try it. Thank you!